AAC members provide quality service and advice to customers and promote high standards of ethical and professional services. Consumer Services • Construction certificates • Occupation certificates • Complying development certificates • Strata and Sub-division certificates. NSW Building Professionals Board administers the Building Professionals Act 2005 in order to improve the quality of building construction in NSW. NSW Building Professionals Board accredits building certifier qualifications for the purpose of registration and informs the public about the competence of building certifiers. Building Certifiers in NSW must by law be registered with the NSW Building Professionals Board. To search the NSW Building Professionals Board's register ... click here. FUMAPEST Ku-Ring-Gai Termite & Pest Control 1300 241 500 are licensed installers of the KORDON Termite Barrier in buildings during construction. 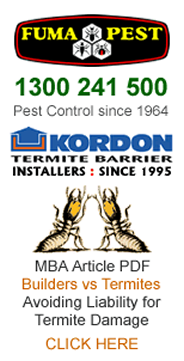 KORDON Termite Barrier for Builders is manufactured by Bayer Australia • complies with AS 3660 and is CodeMark Accredited to meet Ku-ring-gai Council requirements. Find Architects & Building Designers in Ku-ring-gaiCouncil region • includes business name • name of registered principals • contact details • address • phone • email • website. Consumer Guides • Working with a ARB Registered Architect • NSW Architects Registration Act 2003 & Regulations • NSW ARB Registered Architects Codes of Practice. Find NSW Govt DFT Licensed Home Builders in Ku-ring-gai Council region. Linked search of NSW Dept of Fair Trading database for home builders. MBA Article • Builders vs Termites • termites can cause serious legal problems for home builders • learn how to avoid such legal liabilities. Consumer Guide for the Selection of a Tree Service Company or Arborist for the purposes of Tree Care & Maintenance • Tree Pruning • Tree Removal • Stump Grinding & Removal. Ku-ring-gai Council TPO Tree Preservation Orders • Ku-ring-gai Council Application Forms • Tree Removal • Tree Lopping • Tree Pruning • Stump Grinding & Removal. AIBS members include building surveyors, building inspectors, building certifiers and businesses performing surveying and certification of building structures to ensure compliance with laws and regulations, and local government planning requirements. ASBC members provide professional consulting services to consumers, builders / contractors, strata groups, the legal profession and as independent court appointed experts. Consumer Services • Building project management • Structural engineering services • General building maintenance and/or remedial building advice. Basix is implemented under the Environmental Planning and Assessment Act. Basix applies to all residential dwelling types and is part of the DA process in NSW. Basix reduces water and energy consumption in homes. These provide a long term financial saving for the homeowner and contribution to the sustainable future of our communities. Housing Industry Association is Australia’s largest residential building organisation. Members include builders, trade contractors, design professionals, kitchen and bathroom specialists, manufacturers and suppliers. Consumer Services • HIA develops and advocates policies regarding housing and renovations recognising the importance of the housing industry. FUMAPEST Ku-ring-gai Pest Control 1300 241 500 for safe effective pest control of cockroaches • ants • bed bugs • fleas • rats • mice • spiders • bees • wasps • silverfish • bird proofing • termite inspection reports • termite control • termite barriers • termite baiting. Remember: Subterranean termites are a highly destructive timber pest responsible for serious damage to millions of homes across Australia • Home Insurance does NOT cover the cost of repairs to termite damaged timbers which often exceeds many tens of thousands of dollars. A FUMAPEST Termite Inspection Report & Treatment Proposal costs $290 for average size home • comprehensive inspection and report • termite control options to AS 3660.